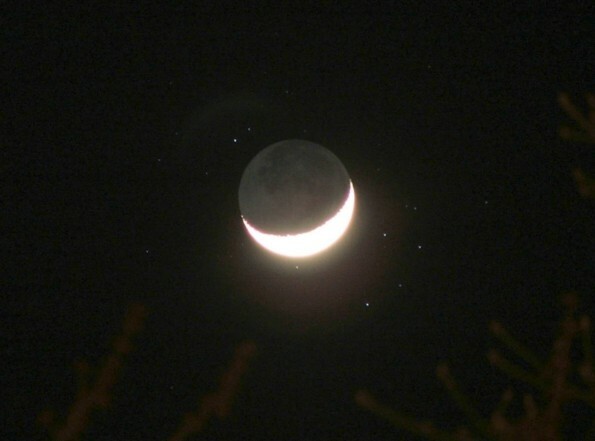 For the larger pics, your browser may scale the pic to the display - click the bottom right corner to enlarge. 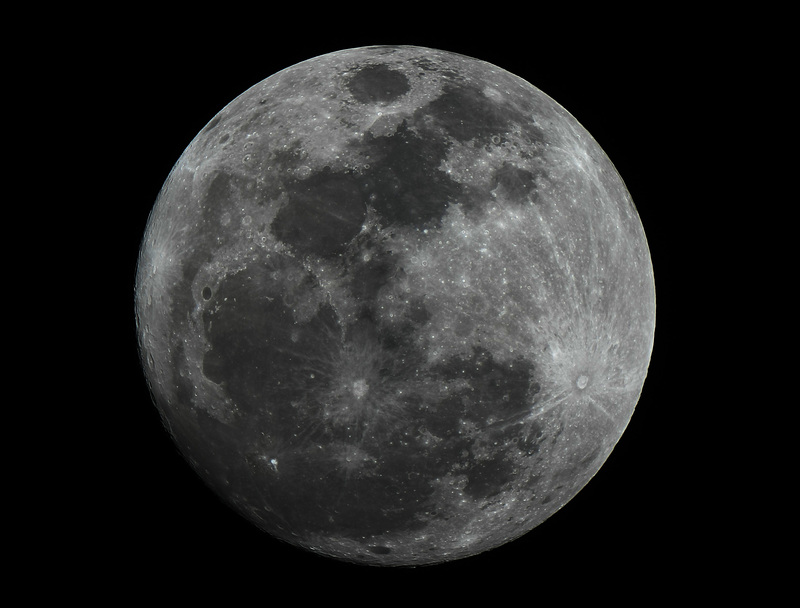 Supermoon (full at perigee), November 13, 2016. 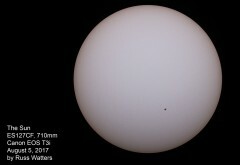 The Sun, August 5, 2017. 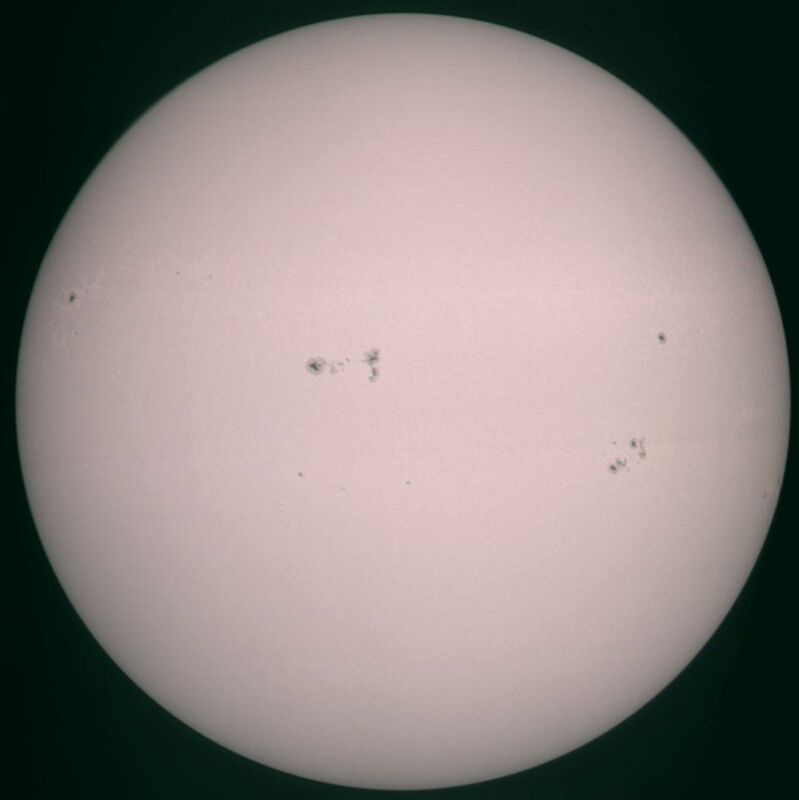 The Sun, November 12, 2016, using a special narroband solar filter and false color from a monochrome camera. 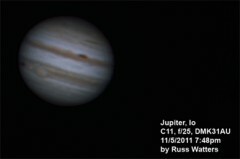 Animation of Jupiter rotating, from November 5, 2011. 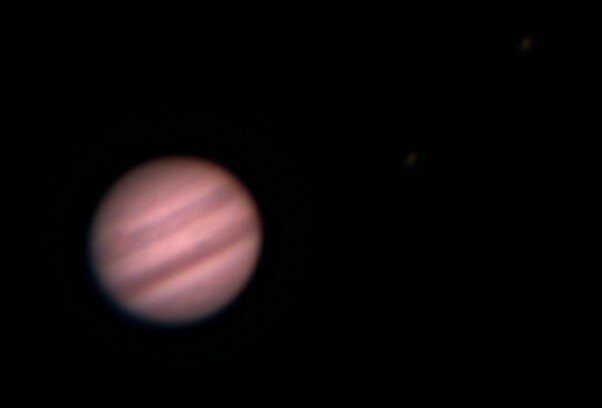 Jupiter, Io. November 5, 2011. 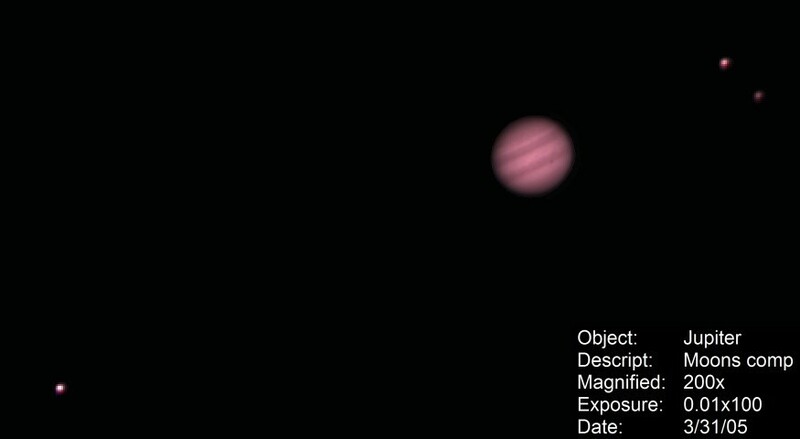 The stripe around the Great Red Spot is back. 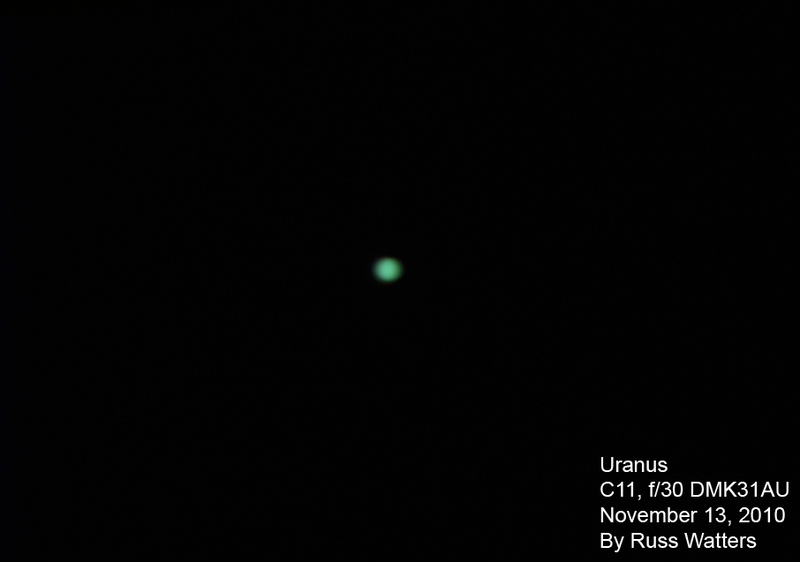 Uranus, November 13, 2010. 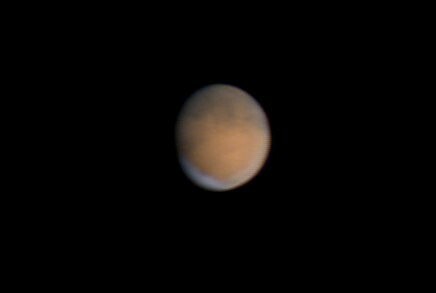 That's about all you can see of it with my equipment. 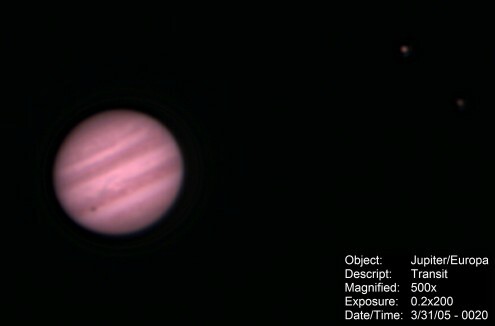 Jupiter, Ganymede and Io, November 13, 2010. 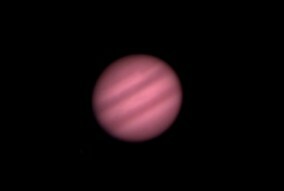 Jupiter lost a stripe for a while! 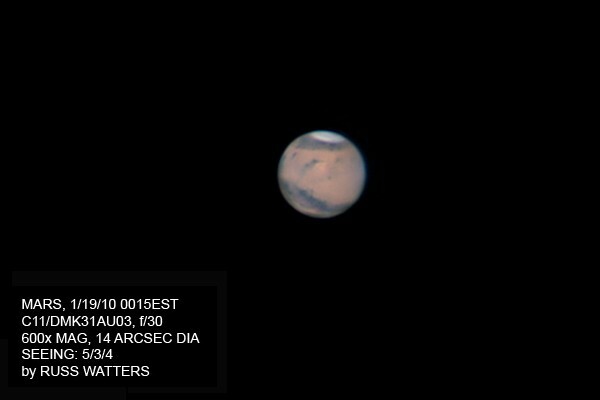 Mars, January 10, 2010. 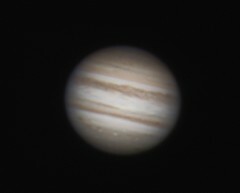 Jupiter, 8/15/09, about 600x magnification. 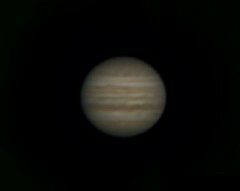 Jupiter is low in the sky, so these are not very sharp. 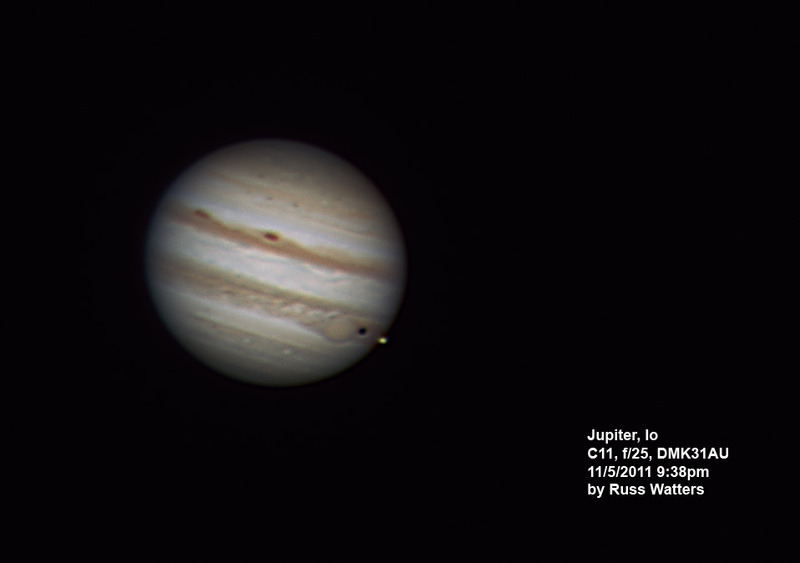 Jupiter with Europa and Io on 8/3/09. 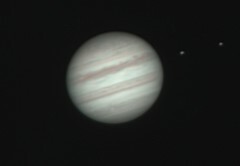 Jupiter with Europa casting a shadow on 7/15/09. 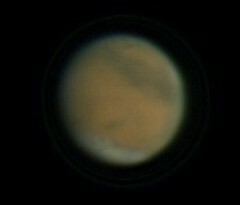 This night the atmosphere was very unstable, so this is only about 250x magnification. 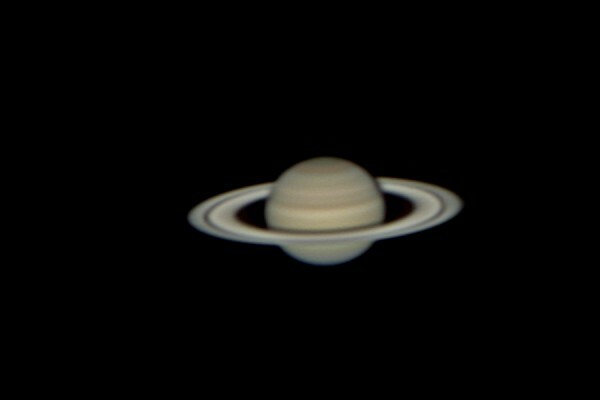 Saturn, 2/9/09, about 600x magnification, taken with my new DMK31AU03 planetary camera. 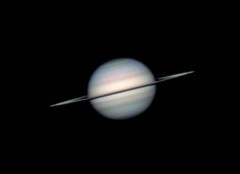 Note how the angle of the rings is changing in this sequence of 3 pictures. Next year, they'll open up and be more visible. Saturn, 2/7/09. 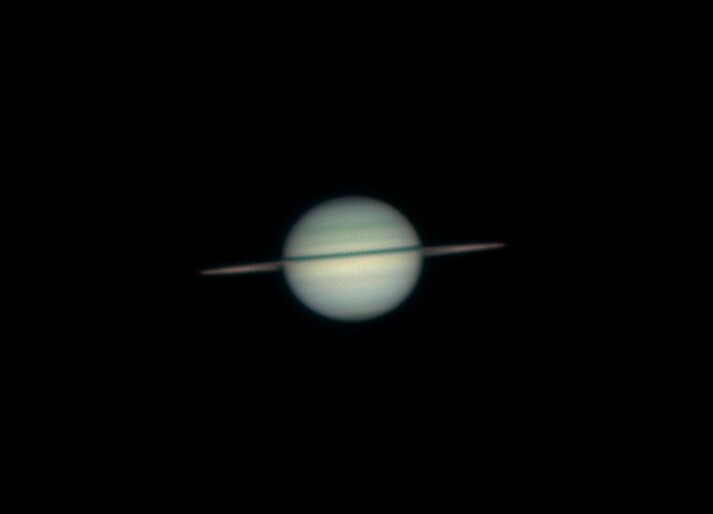 Saturn, 1/29/09. The colors are tough to balance properly and this was my first attempt with the camera. 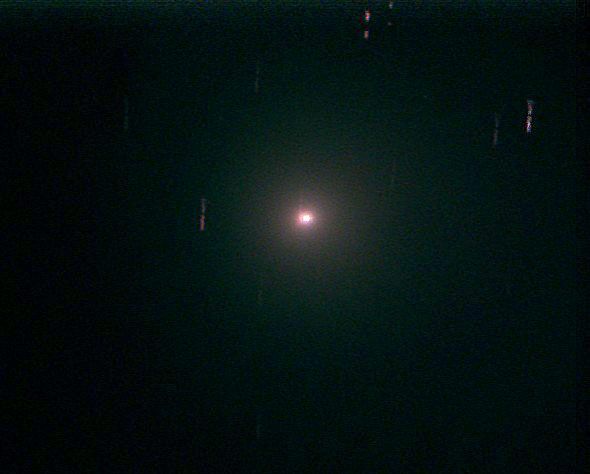 Comet Lulin making a close pass by Earth on 2/24/09. 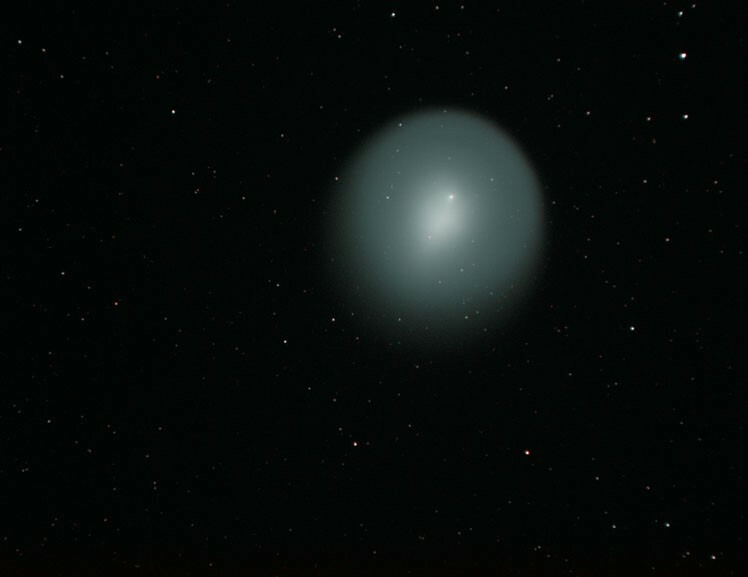 This is 18 minutes of exposure and the streaks are the backdrop of stars the comet is moving past. 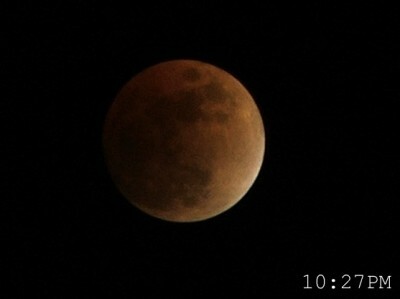 This is a still of the February 20th, 2008 lunar eclipse, taken with an ordinary 10x zoom digital camera on a tripod. 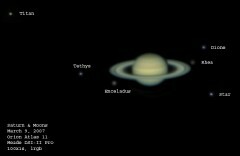 Animation of the eclipse: Click for the full size version (warning - big file). Here are two images of the moon, taken on consecutive nights at the end of March, 2007, with two different cameras and telescopes. 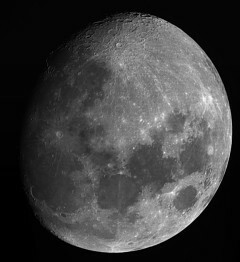 This image was taken with my ED80. 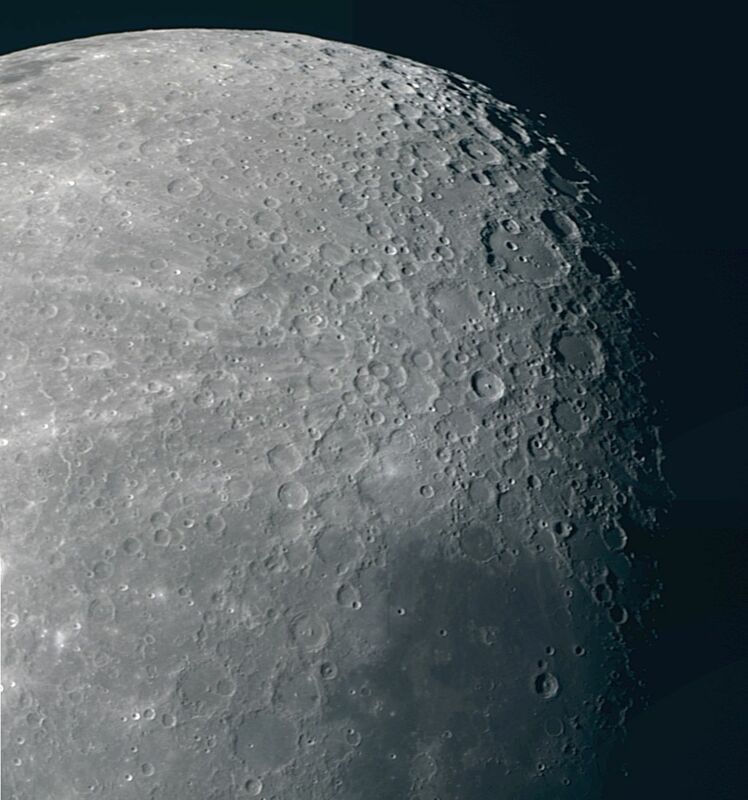 The Moon is almost pure gray. 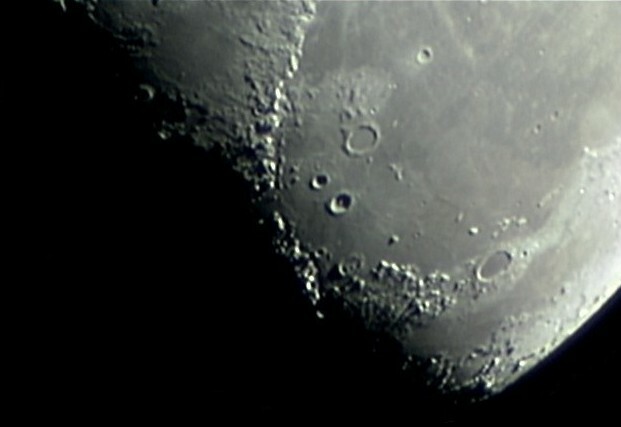 These two images are black and white (as will be most I take in the future). 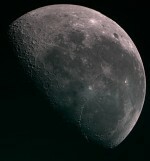 Notice in this one, there is a crater near the dark edge that just catches the sunlight, but didn't the previous night. 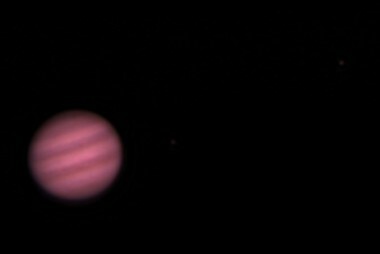 Jupiter and moons Io and Europa, 5/8/07. 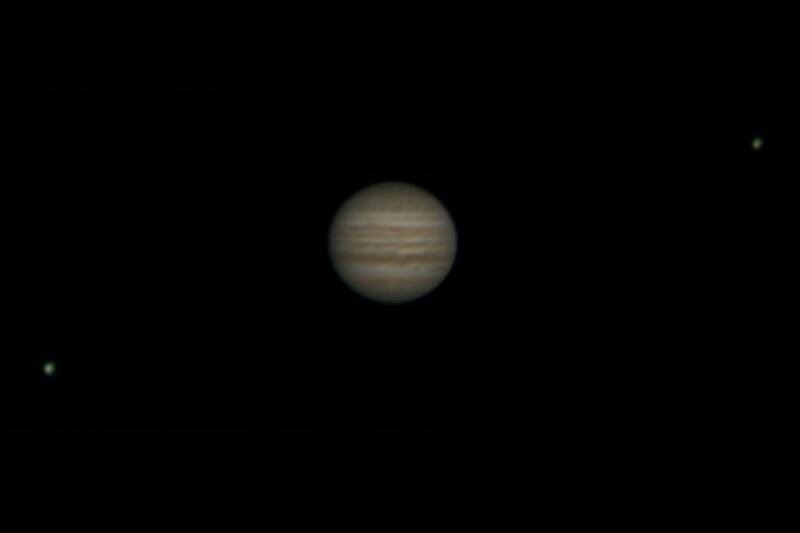 This is my first Jupiter with the new scope. 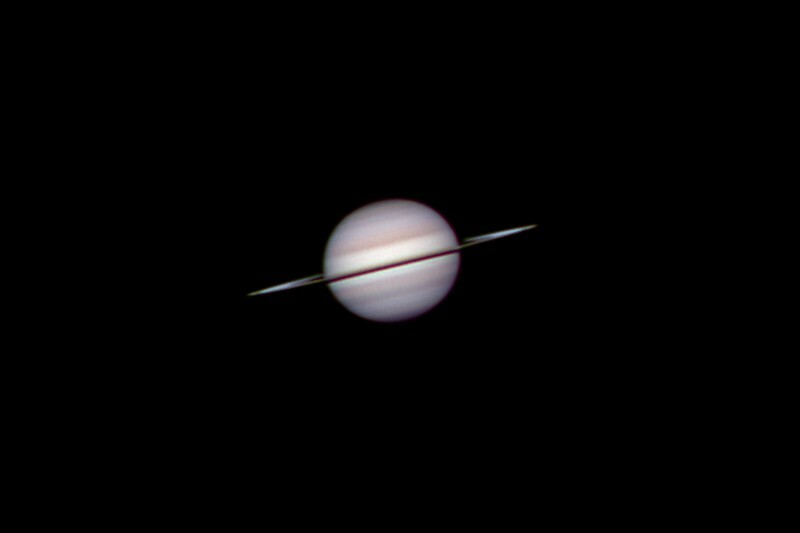 It's about equal to my best from my old scope, which isn't bad considering the planet was only 25 degrees above the horizon. 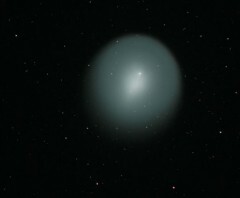 Comet Holmes was a relatively boring comet that passed by earth in the fall of 2007, with few people noticing...then it exploded. 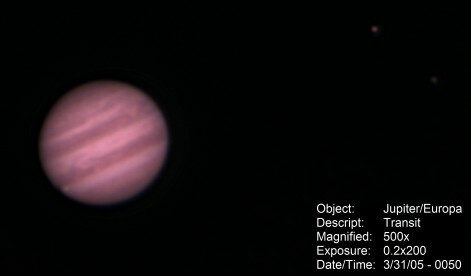 Here, the outer cloud of gas is larger than the planet Jupiter and covers an area of the sky larger than the moon. 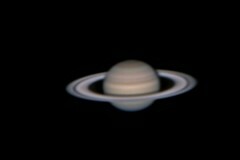 Saturn, 2/26/07, my best yet by far. It is about 650x magnification. 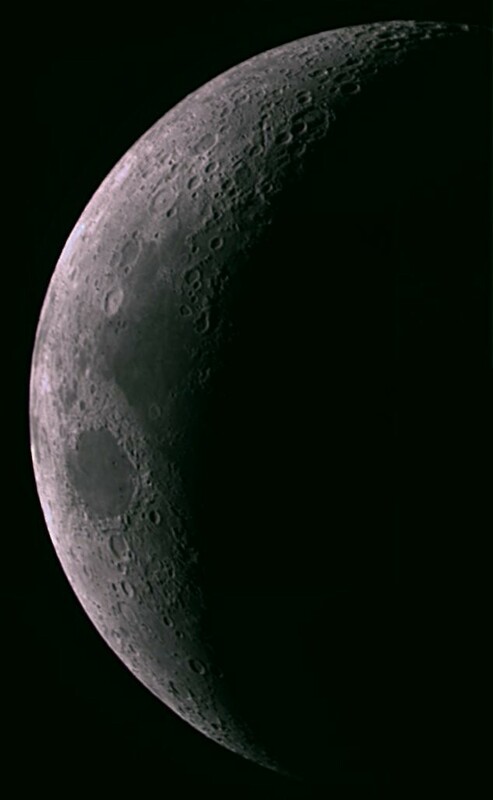 Same image with slightly different processing options. I like the little more blue, but frankly I'm not sure which is really more natural. 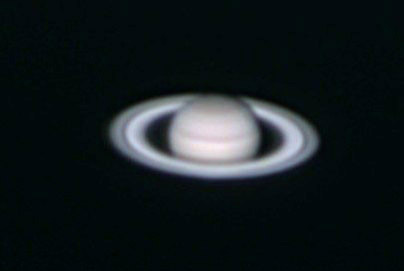 Saturn, 12/16/06, taken with the DSI-Color. 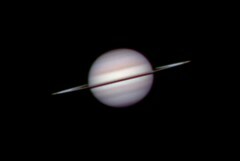 Saturn, 3/9/07. 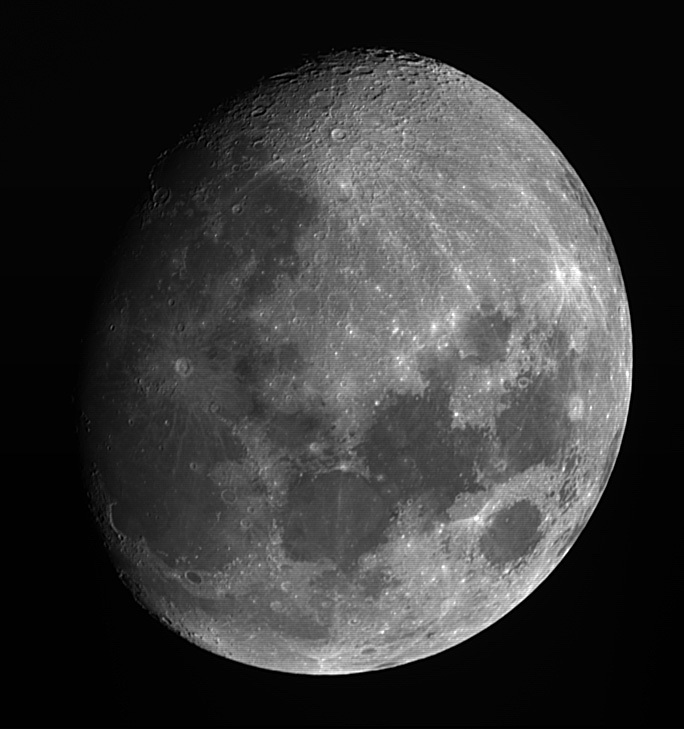 Composite of 100x1s lrgb for the moons with my DSI II Pro and 500 frames stacked for the planet with the DSI Color. 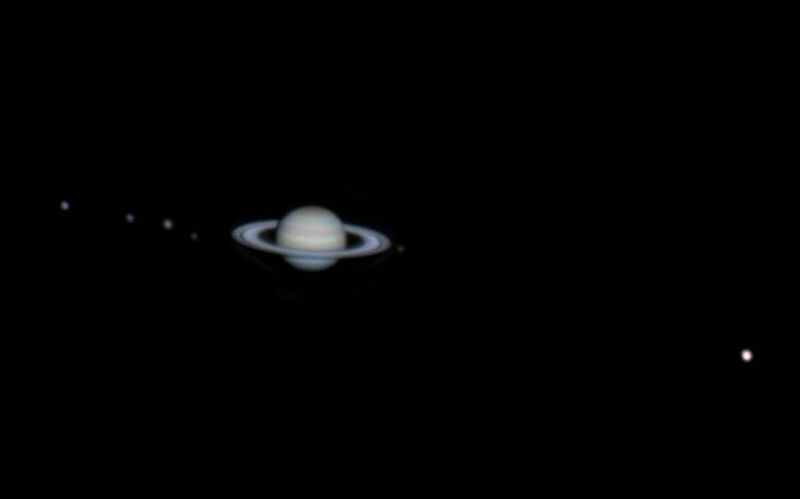 Composite of Saturn on 2 different days, the moons taken 1-17-07. 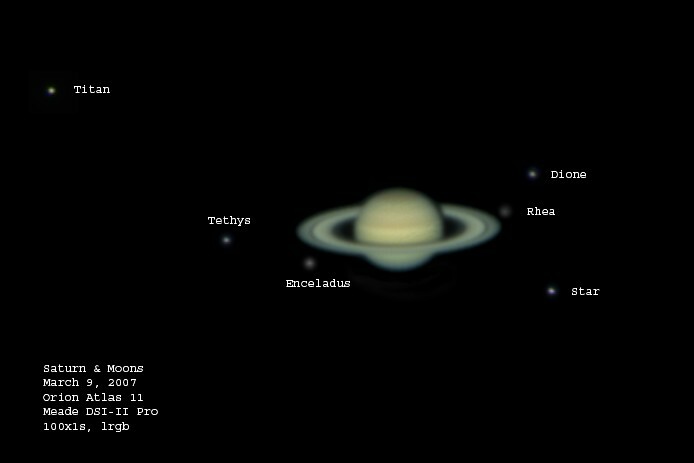 From left-to-right, the moons are Rhea, Dione, Tethys, Enceladus, Mimas (dim, just to the right of Saturn), and Titan. 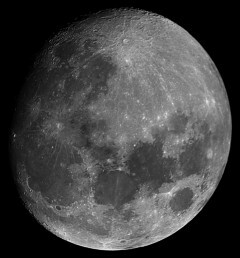 The Moon (a 2x2 mosaic), 12-29-06. 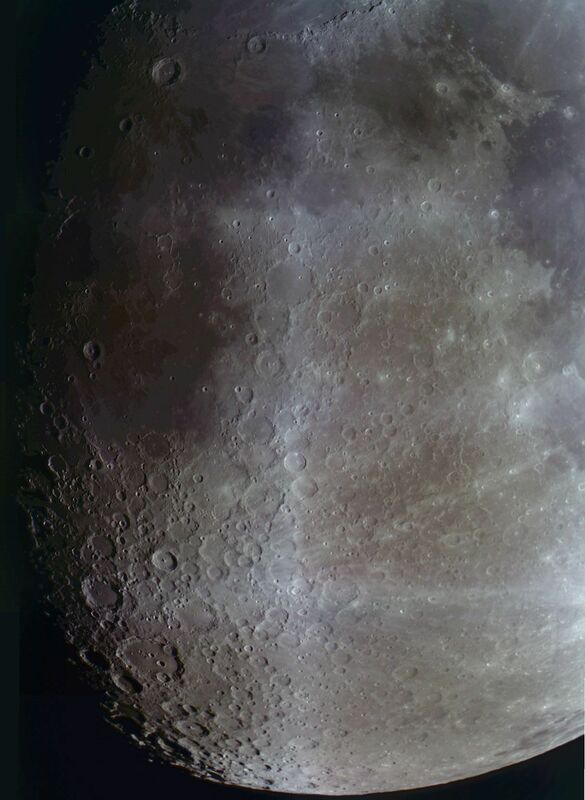 Good contrast/detail in the crater in the upper-right. 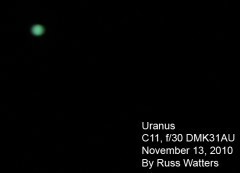 Warning - big image file. 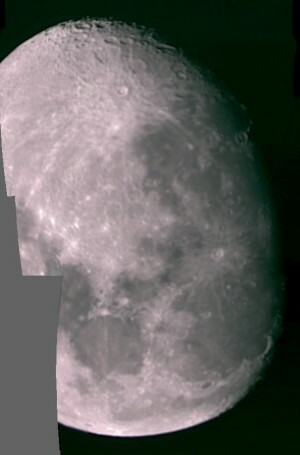 Same night, taken with a webcam (2x3 mosaic). High resolution, but uneven color. 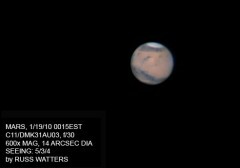 Warining - big image file. Moon, 10-9-06. 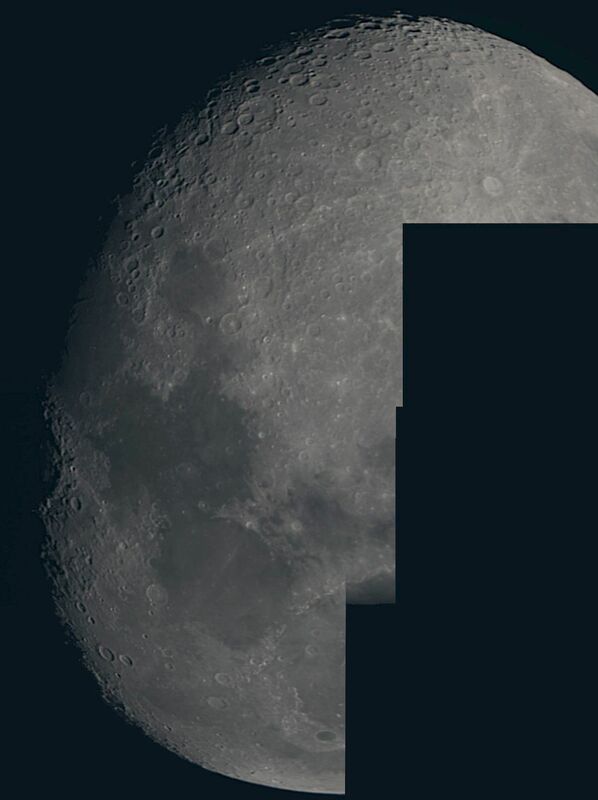 2x4 mosaic. Warning - big image file. This is my first ever attempt at astrophtography, 11/5/04. 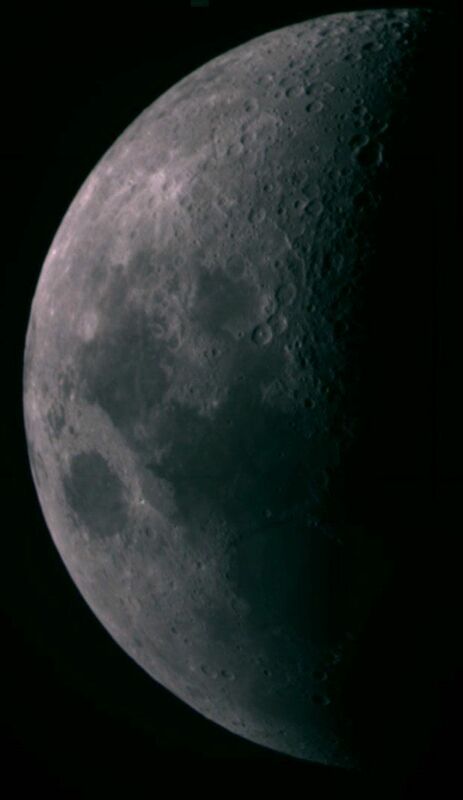 I used my old 60mm refractor, unguided, with a Quickcam 4000 webcam. It's not much to look at, but it lit the fire. 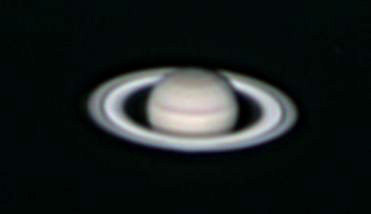 This is my first decent pic of Saturn - taken with my EXT-105 (all the rest are with it) and the Quickcam 4000 on 11/25/04. Magnification is about 150x. 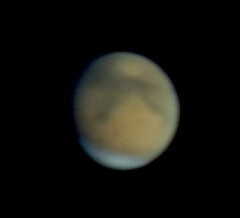 (not clickable) This pic was taken on 2/1/05 with my Meade Deep Sky Imager camera. 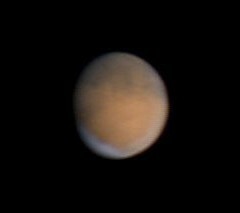 All later pics are taken with this camera. 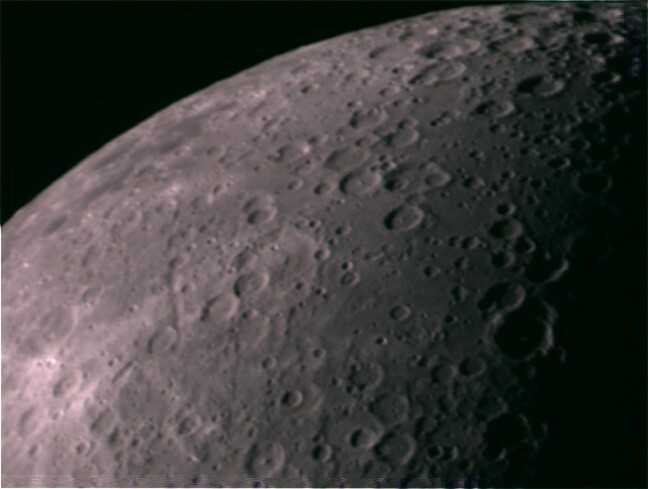 A Barlow lens is used for a magnification of about 400x. 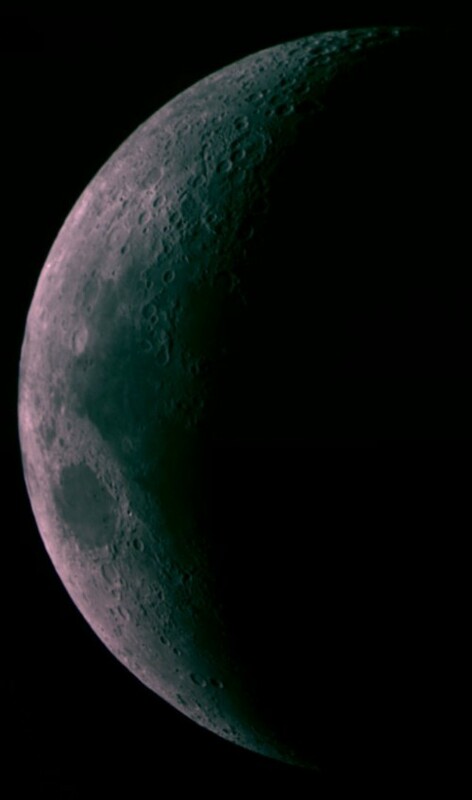 Same as the previous pic, but with different processing options. 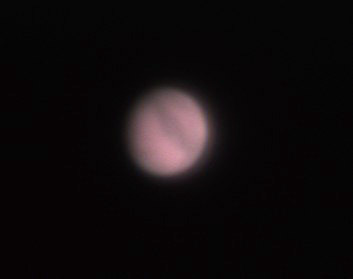 This is Jupiter, and if you look closely, Europa and Io to the right, taken on 2/1/05. 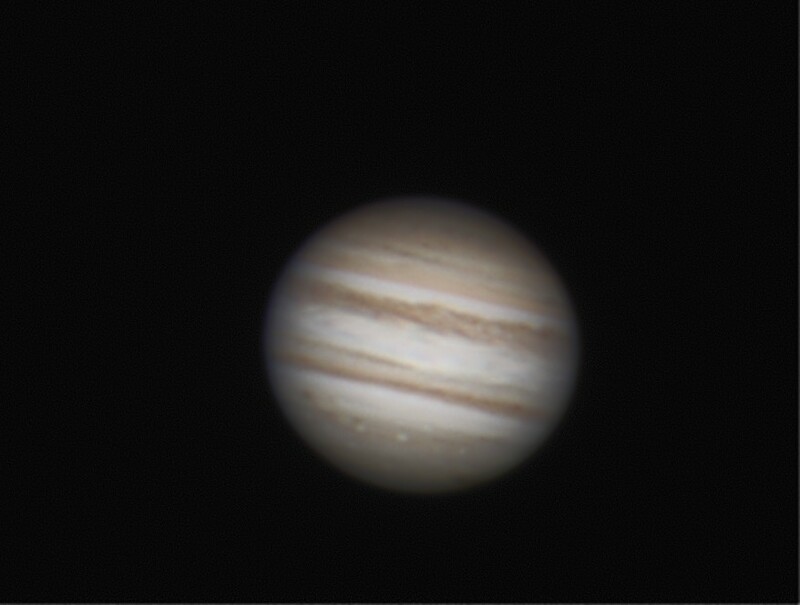 This is Jupiter on 2/19/05. 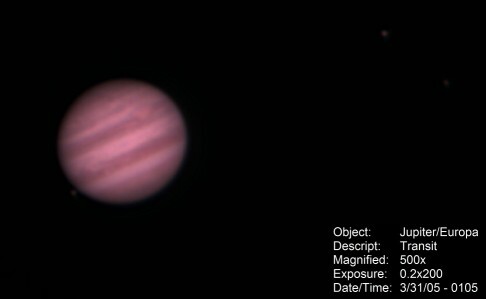 This is Jupiter, and again if you look closely, Europa and Io to the right, taken on 3/5/05. 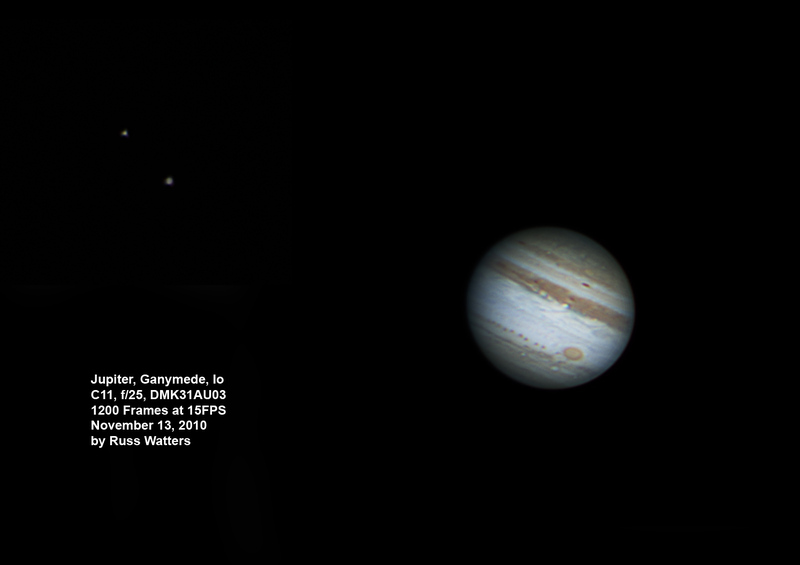 This is a composite of Jupiter, Europa, Io, Ganymede, and Callisto, taken on 2/19/05. 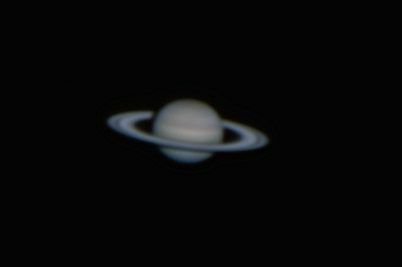 Short exposure and higher magnification for the planet, longer exposure and lower mag for the moons. 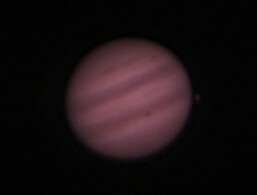 This and the next photo are Europa passing in front of Jupiter on 3/5/05. 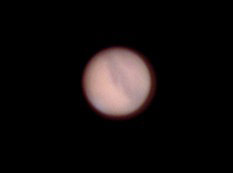 Europa's shadow is visible in the middle of the lower dark band. 3d scale is tough on these pictures - Eurpoa looks like it is close to Jupiter, but actually it is around a foot above your computer sceen. This is an animation of a Europa transit on 3/30/05 (click to play). It's about six hours worth of photos. 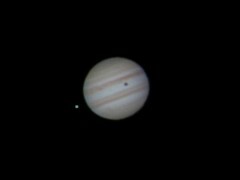 This and the ones to the right are Jupiter and the 3/30 Eurpoa transit. 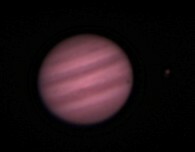 This one is a composite, also showing the moons Ganymede, Callisto, and Io. These next three are in sequence. 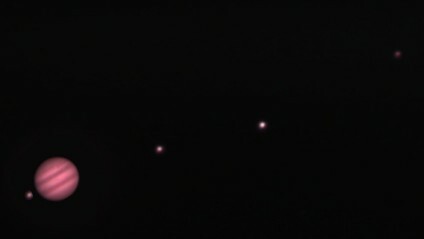 In this photo, Callisto and Io are just visible to the right of Jupiter and Europa is to the lower-left. 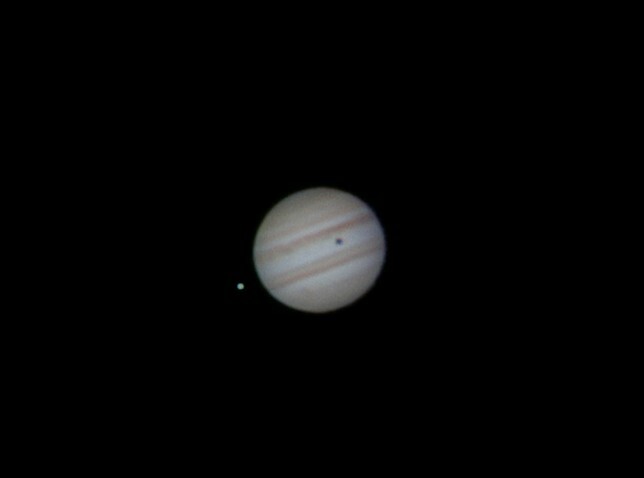 Europa is just visible, right next to its shadow, just emerging on the lower-left side of the planet. 9/27/05 This is an animation of the photos I took on 9/27. 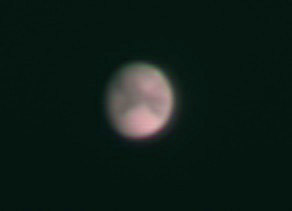 Mars started low to the horizon, so it was pretty blurry. This animation covers about 6 hours. 11/2/05. 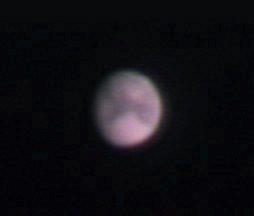 This photo was taken with a webcam - I wanted to compare the quality. 11/2/05 with my DSI. This next series of pics needs no introduction, does it? The larger pics here are composites of 2-6 photos. 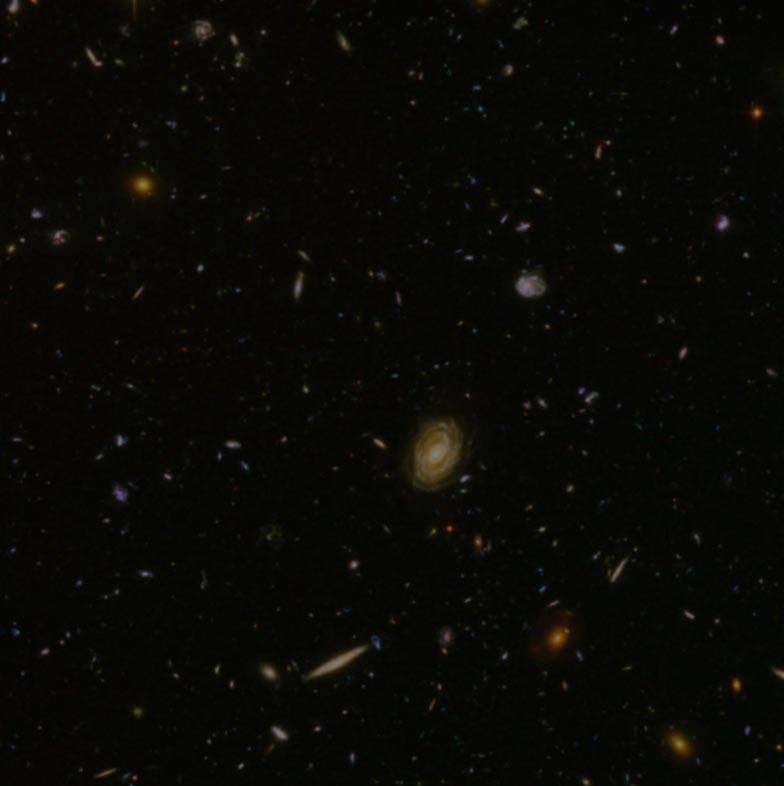 Some of these, IE may shrink in your browser to fit them on the screen: click the box in the lower-right corner of each to see them full-sized. The sun, 7/1/05. 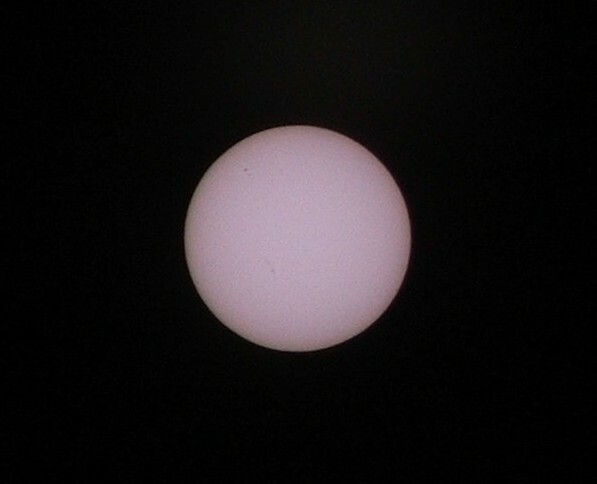 This photo waas taken with a 10x zoom digital camera and a solar filter. 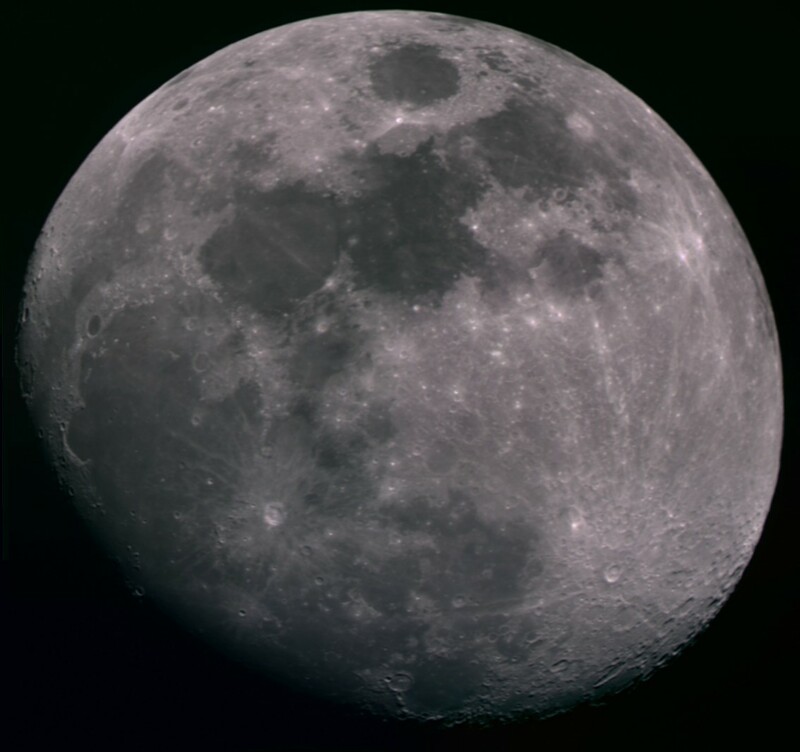 The filter looks like tinfoil and blocks so much light it looks opaque unless you hold it up to the sun or look at the filament of a light bulb with it (you can't even see a frosted bulb through it). 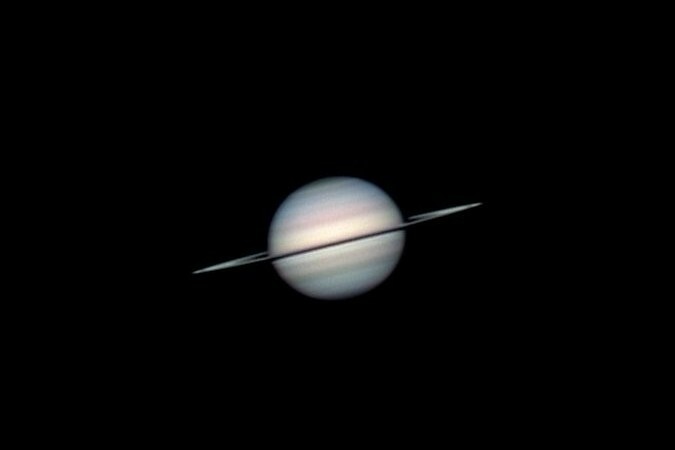 This is a composite taken through the telescope, using the filter, on 7/4/05. 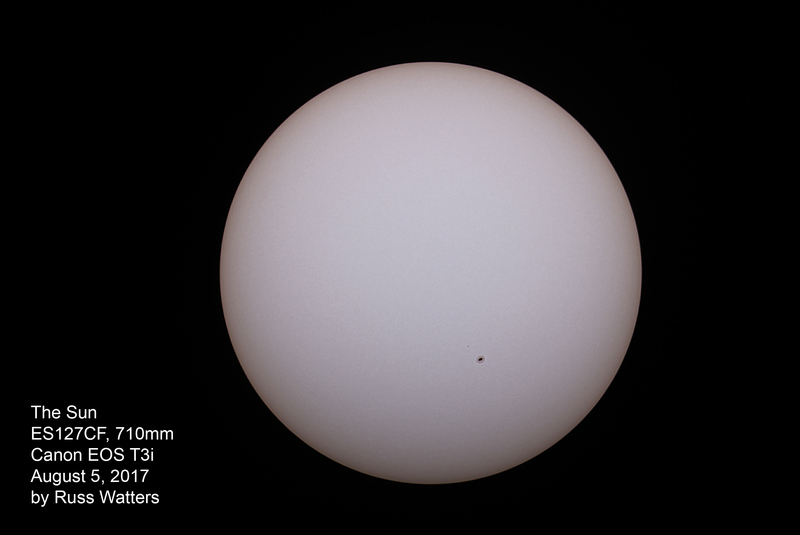 Sunspots are clearly visible. 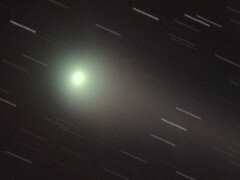 Comet Macholz, taken on 1/1/05. 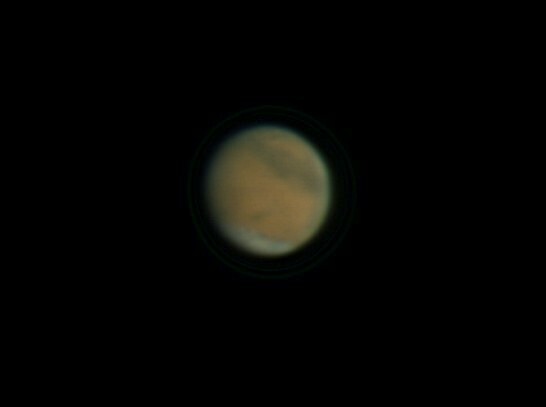 Unfortunatly, there was very little outgassing, so there was no tail. 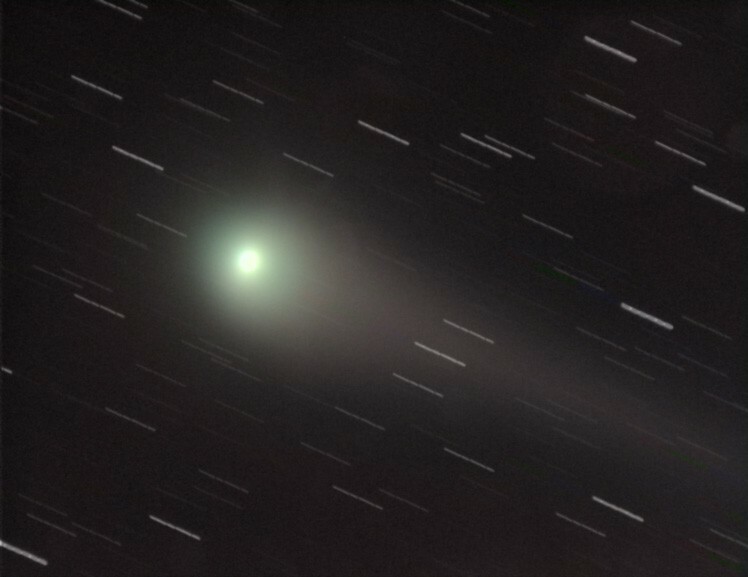 What is interesting is that the comet moves so fast that the stars in the background show trails after only about 5 minutes.